The book I reviewed was sent to me by the publisher. Making sense of a global conflict can be kind of like trying to put together a thousand-piece jigsaw puzzle without looking at the picture on the box. Conflicts are part of life. It is impossible for anyone to agree all the time. Conflicts that happen between individuals are often resolved quickly, without a fight. Other times there can be violence. Though not always, yet Global Conflicts, conflicts that happen between countries, do seem to involve some type of military force to bring about a solution. Why Do We Fight is an excellent resource for social studies classes. Walker does a terrific job helping students recognize the structure, factors, and complex histories that go into creating conflicts, whether personal or global – as well as similarities between both. The book also offers tools for understanding the questions to ask to make informed opinions, and encourages teens to respect those who may take the opposite point-of-view. The writing is engaging and the book’s design is very appealing. Each page is a mixture of white, black, yellow, and gray that gives an overall tone of calm. Chapter headings are in bold set against yellow; gray boxes highlight a definition of important words which might not be fully understood in this context. For example, “Equality”, “Security”, Discriminate”. Maps, sidebars, graphs are used for more details. Also, interspersed throughout the book are quotes from well-known individuals, throughout history, who support peace. Walker concludes by saying there’s more than one way to see the conflicts happening around the world. She challenges readers to look beyond what the headlines state. Just because the answers aren’t always clear or easy to come by, that doesn’t mean you should give up looking for them. Back matter includes source notes, author’s note, and index. Today, as we acknowledge 9/11 and events that have happened in our world since and in the future, share Why Do We Fight with students to offer them hope that conflicts do not have to mean war for their generation. This book will be on our best of 2013 list. Thanks for sharing this. I have been very curious about this book ever since I heard about it, the more so because one of my blogs completely focused on books written for kids about WW2 and depictions of how it impacted kids. 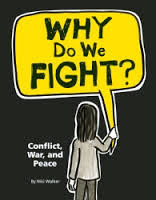 Alex -- Why Do We Fight is a great resource; a good book to share when talking about what causes war.